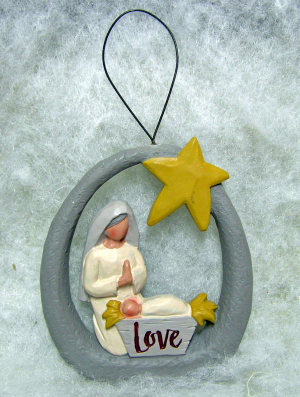 This resin ornament features a manger that says "LOVE" on the front and has baby Jesus in it. It also has Mary, an oval surrounding it and a star at the top. It measures 3 x 2 3/4 x 1/2 + hanger. 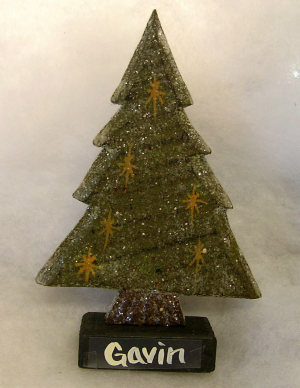 This wooden Christmas tree has stars painted on it and a glittery finish. 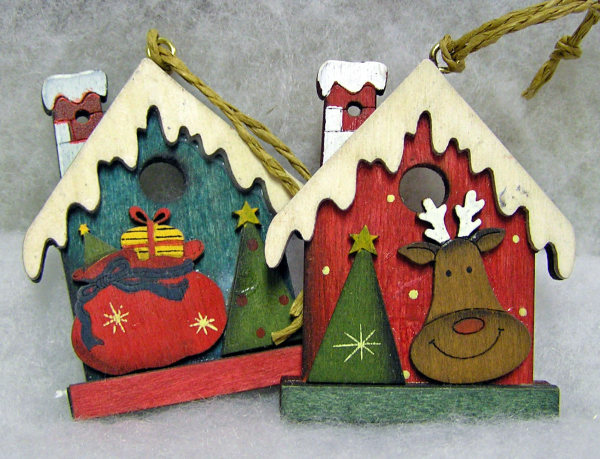 It is mounted on a wooden base and can be personalized on the base. It measures 6 x 4 x 1. 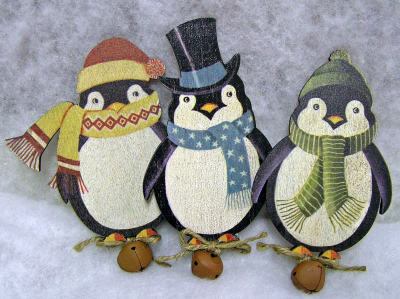 These cute wooden penquins come in three styles: Yellow Scarf Penquin, Blue Scarf Penquin, and Green Scarf Penquin. They have jute bows and rusty tin bells at the bottom and a wire hanger. They measure 5 1/2 x 3 x 3/4 and hanger. These wooden penquins are magnets and come in three styles: Yellow Scarf Penquin, Blue Scarf Penquin, and Green Scarf Penquin. They have jute bows and rusty tin bells at the bottom. They measure 5 1/2 x 3 x 3/4. 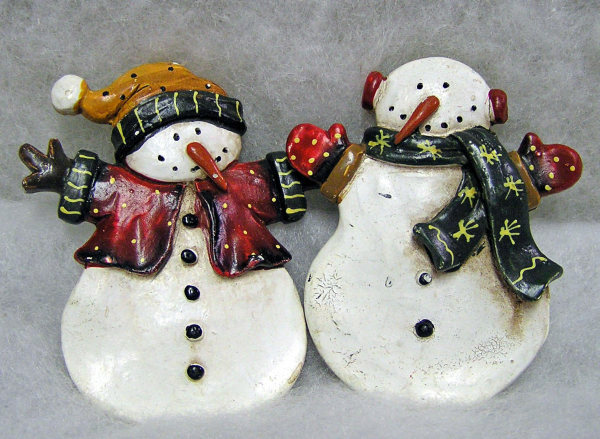 These adorable resin snowman magnets come in four styles: Top Hat Snowman, Red Hat Snowman (shown), Gold Hat Snowman, and Ear Muff Snowman (click on photo to see these options). They measure 2 1/2 x 2 x 1/2. 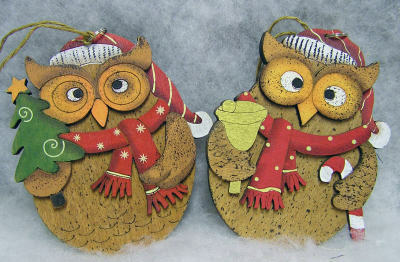 This wooden owl is so cute...he has a snow cap and separate wooden pieces for his eyes, scarf, and wings holding a pine tree. He measures 4 X 4 X 1/2. 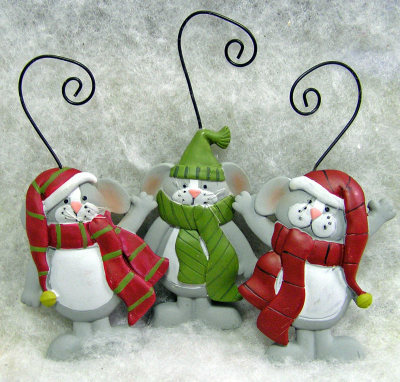 These cute resin mouse ornaments come in three styles: Red/Green Scarf, Green Scarf, and Red Scarf. They have little whiskers, snow caps, and curled wire hangers. They measure 3 x 2 x 1/2 + hanger. 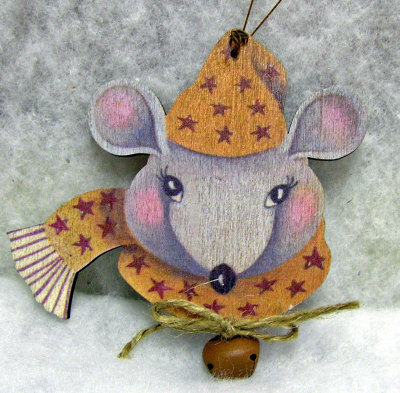 This cute wooden mouse has a matching hat and scarf as well as a jute bow and rusty tin bell at the bottom. He has a wire hanger. He measures 5 x 4 1/2 x 1/2 + hanger. 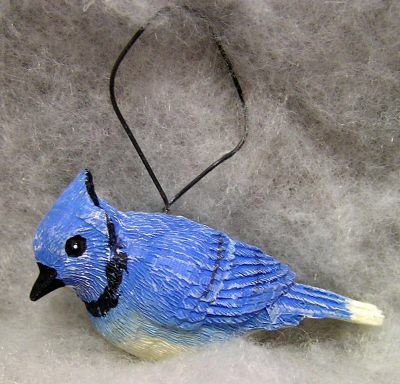 This resin bluejay is finished in beautiful shades of blue. It measure 1 1/2 x 2 1/2 x 1. 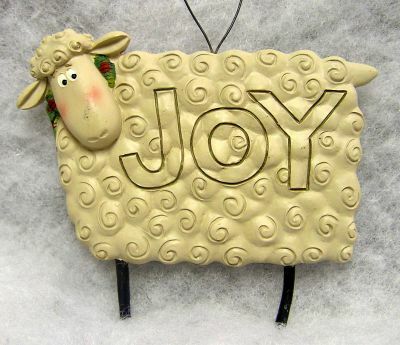 This curly haired sheep features wire legs, green scarf and wire hanger. It says "JOY" on the front. It measures 4 x 4 x 1/2. 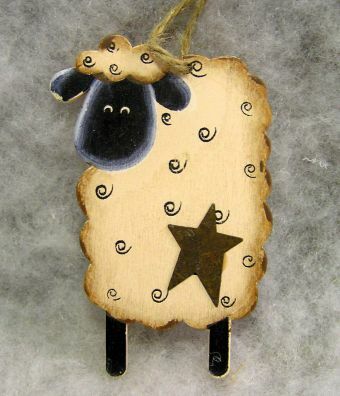 This cute little wooden sheep features a black face, a jute hanger, and a rusty tin star. It measures 3 1/2 x 2 x 1/4 + hanger. 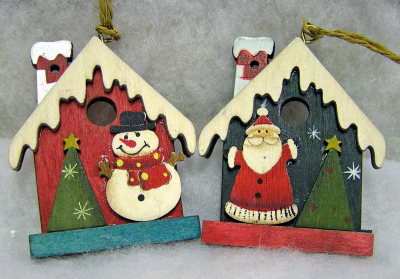 These little wooden winter houses come in four styles: Snowman, Santa (shown), Presents and Reindeer (click on photo to see these options). They have lots of details with chimneys, snowy roofs, and cut out trees. 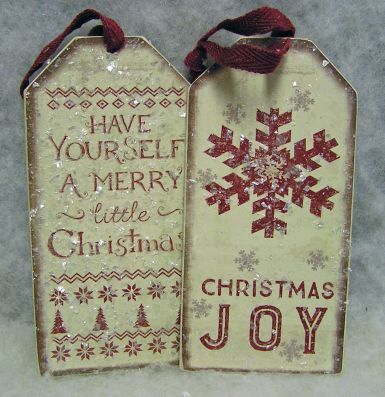 They have jute hangers and can be personalized on the base. They measure 3 x 2 1/2 x 1/2. 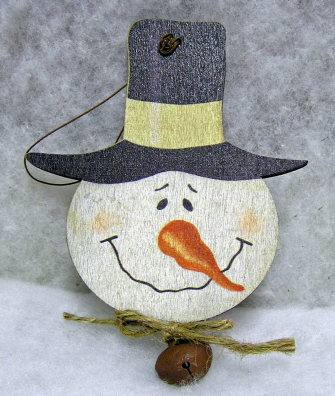 This wooden snowman head ornament features a top hat, big smile and carrot nose. He has a jute bow and rusty tin bell at the bottom and a wire hanger. 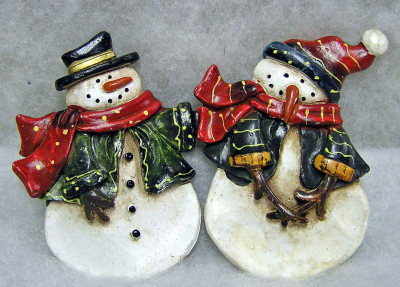 This wooden snowman has a smiling face with carrot nose. 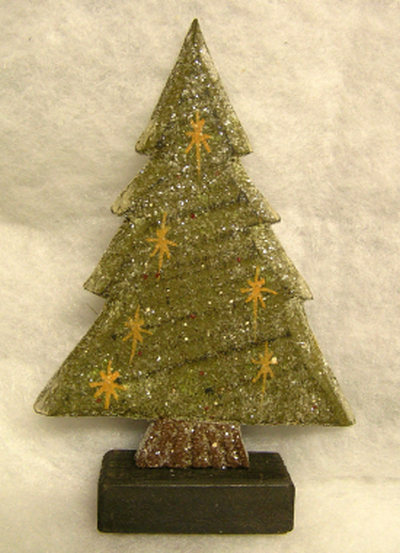 There is a wooden tree on the front and he has a gold wire hanger with a red ribbon. It measures 4 x 3 x 1/2 + hanger.